in part is that aluminum was considered a precious metal in 1884, costing about as much as silver. The high price of aluminum was due almost solely to the insane method that Frishmuth used to produce this metal. In an earlier post I described how aluminum oxide (a.k.a. alumina; Al2O3) is isolated from the ore bauxite. With this metal oxide in hand, all that is left to do is remove the oxygen atoms to produce metallic aluminum. Most metal oxides, such as iron oxide (a.k.a. rust; Fe2O3) can be turned into their pure metal counterparts by treating the metal oxide with coke. Coke is kind of like charcoal, and is essentially a big block of carbon atoms. By heating a mixture of rust and coke, the oxygen atoms move from being bonded to the iron atoms to being bonded to the carbon atoms, producing metallic iron and carbon dioxide. This type of reaction is a big deal, and is in part what led to the bronze age and iron age (more on that in this post). This reaction is contingent upon the fact that oxygen prefers to bond to carbon atoms over iron atoms. However, as was discussed in the previous post on thermite, oxygen atoms really love to be bonded to aluminum atoms, so this reaction doesn't work for aluminum. After separating the water from the aluminum chloride (not sure how he did that though, any thoughts? ), Frishmuth then heated the crap out of water-free aluminum chloride in the presence of the metal sodium. That is seriously a LOT of sodium to be dropping into water. Way unsafe. So everything in Frishmuth's aluminum world was totally cool until in 1886, a new method, now known as the Hall-Héroult process, was invented for the production of aluminum. 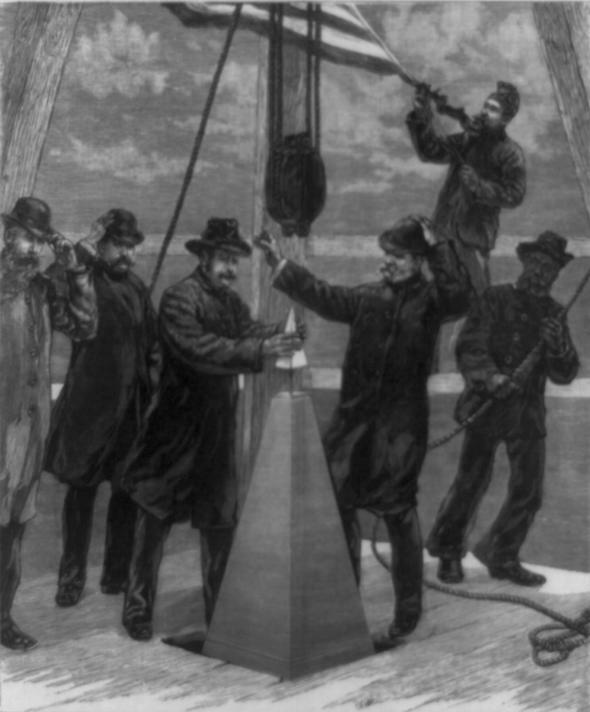 This method was way cheaper than Frishmuth's method, which meant that by the time the Washington monument was dedicated in 1888, aluminum was no longer such a precious metal. The Hall-Héroult process is cheap in part because it makes aluminum directly from alumina, without the need to use sodium. It does this by heating the crap out of alumina in a solution of the molten salt cryolite (Na3AlF6) in the presence of coke (carbon). As I said before, the oxygen atoms in this case prefer to bond with aluminum atoms. So in order to coax the oxygen atoms off the aluminum atoms and onto the carbon atoms, energy is added to the system by passing electricity through the solution. Over 100 years after the invention of this process, this is still the way people produce aluminum today. Having been bested at his own game by the young whippersnappers Hall and Héroult, which meant he was no longer the aluminum king of the united states, Frishmuth eventually took his own life in his Philadelphia apartment in 1893. SO DARK! So as to not leave you on a down note, check out this wicked video of jupiter taken by Voyager I in 1979. You can even see Jupiter's moons flying by. MESMERIZING! Until I saw this it somehow never occurred to me that the movement of jupiter's atmosphere would be on a timescale view-able by humans. Wow, Jupiter is completely insane! Like, why do the different bands spin in different directions, and why does each band keep spinning in the same direction all the time? And why doesn't all the stuff just mix together? i really have no idea. it has something to do with the coriolis effect, the band spinning that is... and I don't understand that at all either. please help us magical internet! send us some astronomers or climatologists or something!!! I like how she left the cap off the rest of the sodium. Smooth move. Looks like frismuth was making aluminum fluorides from the oxides, and then subjecting them to Na vapors, although ppl also describe electrolytic reduction of aqueous solutions of AlF3. someone needs to get that woman with the bottle of sodium under control. That was ridiculous. Do u need Aluminum for transmitting High Radio frequency? Another choice might be copper, as it has an even lower resistivity than aluminum and is cheaper, though its increased weight is most likely problematic due to the fact that radio towers extremely tall and a lighter-weight material would be cheaper to hold aloft.